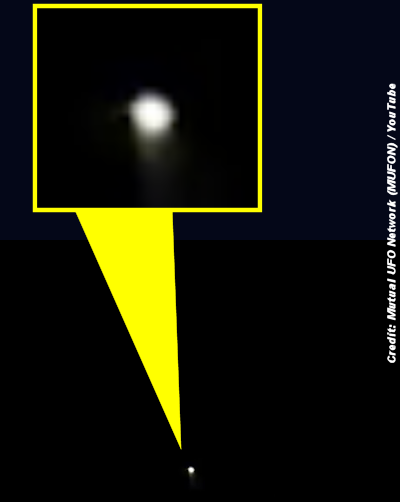 The Mutual UFO Network (MUFON) has listed a video from Boise, Idaho as one of their top cases from 2013. The video itself is interesting. However, what is more interesting is that the UFO was sighted by three separate groups of people, and all of the reports were very similar. The sighting took place on the evening of December 24, 2013 at approximately 9:15 pm. The reports were all within 9:15 to 9:30 pm. The object was reported by all parties as being a bright red light. They also say that a second red light appeared to drop down from the first. It moved slowly and then sped off quickly as both objects disappeared. He says his wife recommended they pull over for a better look, so they did. He says they could then tell that the object was not moving. The couple decided to rush home to get a camera to record the lights. He told the MUFON investigator that he always keeps his camera charged just in case he sees a UFO. The witness said they only watched the object for a few second before rushing home. Prior to filming they had seen a small orb drop from below the object. He says they caught a second object dropping from the bright red light on camera. In the video (seen below) a small blinking object can clearly be seen dropping from a larger brighter one. It moves down, then moves up again, before dropping down and moving off screen very quickly. . . .